A list of our Beginners Pilates Mat Course can be found here. My husband and I have been attending sessions with PilatesCan for more than ten years almost continuously. Our instructor, one of the owners, is outstanding. Her ability to identify even apparently minute issues in posture, movement and technique is unbelievable. She is also then able to quickly offer an exercise which targets the appropriate parts of the body to deliver results. All from memory! Her knowledge, currency, and advice is excellent. As an ontological coach, I understand that a person's fundamental way of being in the world is impacted on by the alignment, fluidity and strength of his or her body. 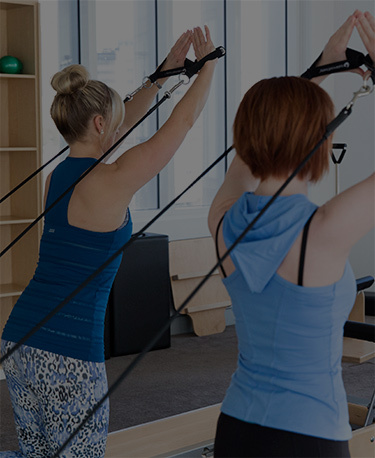 PilatesCan are experts in helping each client become adept in the development of their own body, with the inevitable flow-on benefits for increased strength and fitness, and reduced physical and emotional stress. PilatesCan has helped me to deal with the challenges of multiple injuries and fibromyalgia, allowing me to maintain a high level of health and wellbeing when I may otherwise have 'given in to my fate.' I cannot recommend Claire and her team highly enough. Highly professional, knowledgeable and friendly staff working from beautiful studios in two convenient locations. The staff have worked closely with me to effectively manage pre-exisiting conditions and a pregnancy. They even reviewed my MRI results and tailored a program to build up my strength to significantly reduce pain. Every week, my back is checked to tweak the program to what my body needs that day. Explanations are given as to why a certain exercise will help and what muscles it is targeting. Thank you Pilates Can for your dedication to your clients and your flexibility to reschedule when life gets in the way. For more than 2 years I thoroughly enjoyed my weekly semi-private classes at PilatesCanManuka. I have some lower back issues, but Claire and Trudy always managed to put me back together again. Their repertoire of exercises and adaptations to suit everyone’s abilities and needs are amazing. I have moved overseas now but truly miss them. Let’s talk about the Pelvic Floor! Can you really have a spring in your thorax?